In the world of Zootopia, the latest from Walt Disney Animation, pesky humans never existed. Which means animals behave like "humans" (even though humans aren’t really a thing). This has good and bad ramifactions, as we learn in the first teaser trailer for Zootopia, next year’s animated Disney feature. Check it out right here. This isn’t so much a plot-heavy reel as it is a trailer meant to educate audiences on what they can expect from the usual world of Zootopia, an animated feature from co-directors Byron Howard (Tangled) and Rich Moore (Wreck-It Ralph), and writer Jared Bush. The voice dominating the teaser belongs to Jason Bateman, who plays Nick Wilde. Though she doesn’t say anything, Ginnifer Goodwin stars as Judy Hopps, the fox’s "natural enemy." Expects sparks to fly. The comedy in Zootopia looks to go far beyond talking-animals-wearing-clothes, however. The key line of dialogue is that, of all the things the movie could focus on, it’s the animals’ use of technology that sets them apart. There are rhinos on cellphones, and Bateman’s fox uses a clapper to turn off the lights, allowing him to take advantage of his exquisite night vision. Just how far the movie goes in pushing that comedic premise will determine whether or nor Walt Disney Animation has another monster-size hit on its hands. 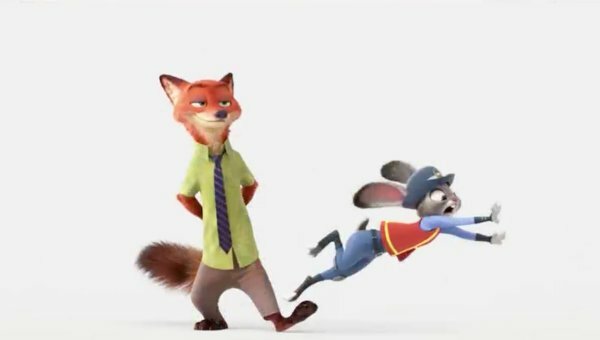 We don’t know much about Zootopia beyond those two voice actors in the lead, though with all of those characters on display in the teaser, you know that Disney’s going to have an army of recognizable actors voicing funny animal characters in this unique world. The thing is, at this moment, putting Walt Disney Animation ahead of the title is as much of a selling point as Pixar was (back in the day). As the title card reveals, Zooptopia is coming to us from te team behind Frozen and Big Hero 6. And prior to those two hit movies, Disney was firing on multiple cylinders by releasing Tangled ($200 million domestically), Wreck-It Ralph ($189 million) and Bolt ($114M). These are money-making movie. More important, these are heartfelt, entertaining animated movies that have helped restore the Disney Animation brand after years of stale features. We have a while to wait until Zootopia hits theaters on March 4, 2016. For now, this is a quick introductory clip that lets fans know what’s on the horizon, and what they might be able to expect from the family animation comedy.